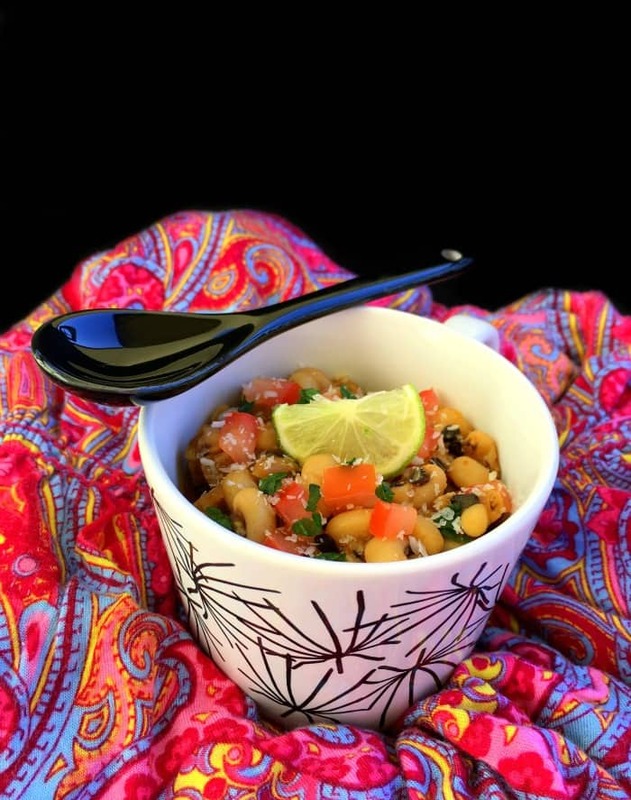 Black Eyed Pea Chili is a hearty vegan and glutenfree chili recipe using beans, seasonal vegetables, and flavorful spices. 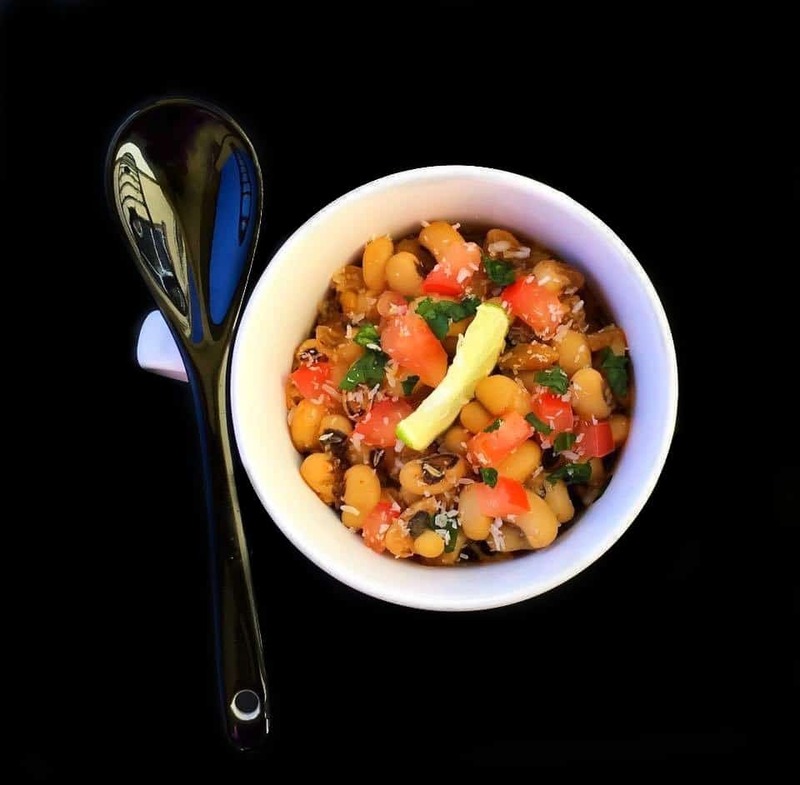 It’s also known as ‘Lobia Masala’ in India and is quite popular among vegetarian options. Hi Everyone, hope you had a nice weekend. 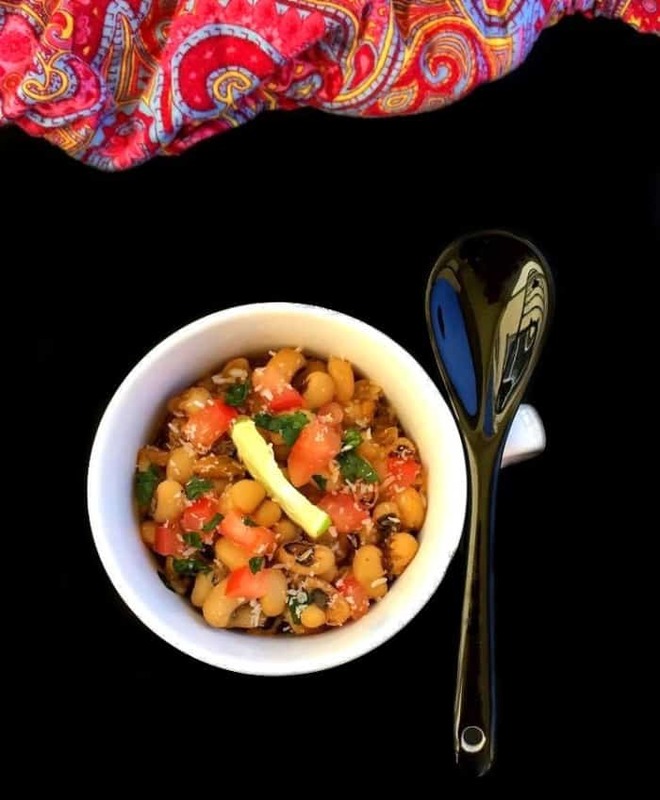 After the Thanksgiving week, we are definitely in the mood for a lighter meal like this Black Eyed Pea Chili. I usually get the ‘raw beans‘ and soak them overnight or a minimum of 5-6 hours, till they plump up. Then you can either steam them in a pressure cooker (3-4 whistles) or cook in a covered pot for about 20-25 minutes. 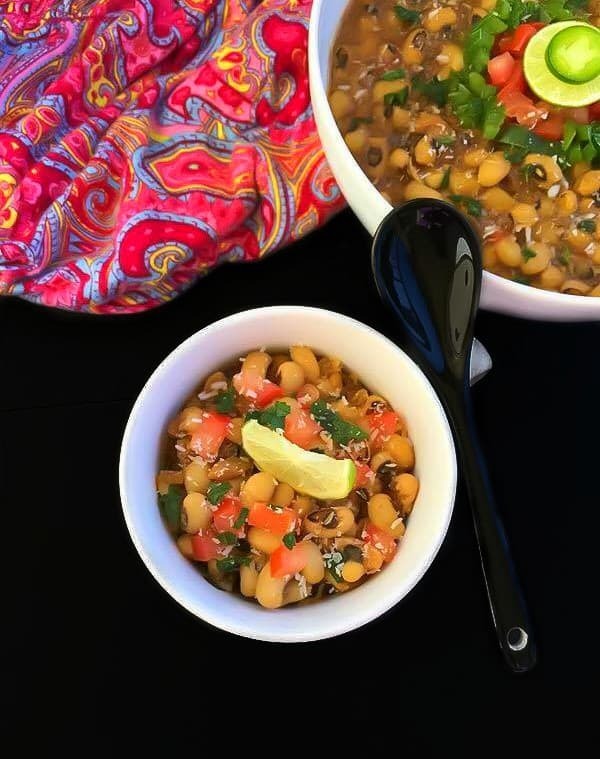 A lot of times, this Black Eyed Pea Chili is my easy goto dinner menu too, just combine with a bowl of rice/quinoa/couscous or even bread whatever you like. etc that also helps in keeping our body warm in winters. To make it more wholesome or one-pot meal, I’m adding vegetables but if you’re craving some meat, feel free to add cooked ground meat of choice. It seriously tastes delicious with everything. Once the chili is ready, you can add more toppings as per choice. Since I wanted to keep it as light as possible, I’m just sprinkling some cheese and fresh chopped veggies. You can find more Meatless Monday recipes on my blog archive along with many detox or light recipes. Heat oil in a large pot or pan. Now add chopped onions and sauté for a minute. Add garlic, celery, carrot, sauté and close the lid. Let cook on low heat for 5 minutes (stir in 2 minutes). After 5 minutes, the spices and veggies would have cooked well, absorbing all the water and flavors. Add tomatoes and cook for another 3 minutes on low heat. Now add the black eye peas, broth/water and cover cook for 10 minutes (stir in 2 minutes). After 10 minutes, the veggies and peas would have cooked together giving the dish an amazing smell. Add chilies, cheese, cilantro and some chopped tomatoes. Stir evenly and transfer to individual bowls. If using canned peas, rinse and strain or if using frozen peas, thaw as per package directions. 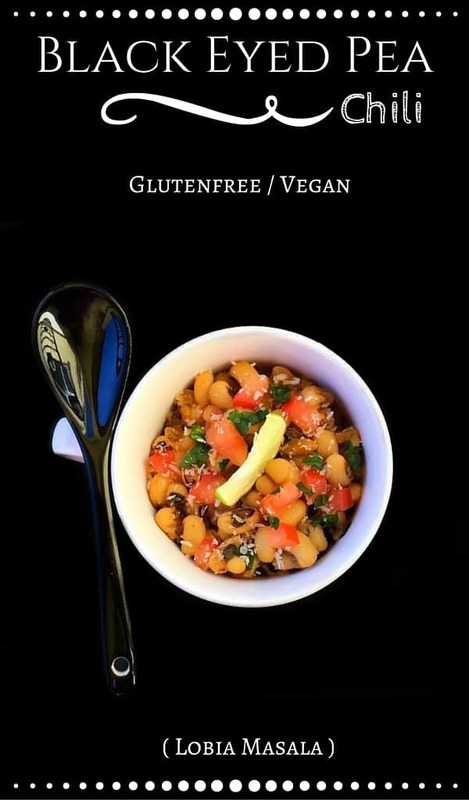 18 Replies to "Black Eyed Pea Chili (Vegan and Glutenfree) Indian Recipe"
This recipe sounds amazing! It caught my eye because of the Black Eyed Peas. I love the idea of making this a soup or chili. My only question is with the term “3 to 4 whistles”? I grew up with a pressure cooker and I’ve used them all my adult life, but never heard that term . My pressure cooker book says to cook black eyed peas 20 minutes. Also, are you suggesting we put the rack in the pressure cooker so that they steam rather than cook? Hi Nancy, glad you liked the recipe and it can absolutely be turned into a chili. You can cook it exactly the way you cook any lentil soup/lentils. I make chili with beans all the time, but never with black eyed peas. I’m going to try them. I love the idea of cinnamon in the mix as well. YUM! 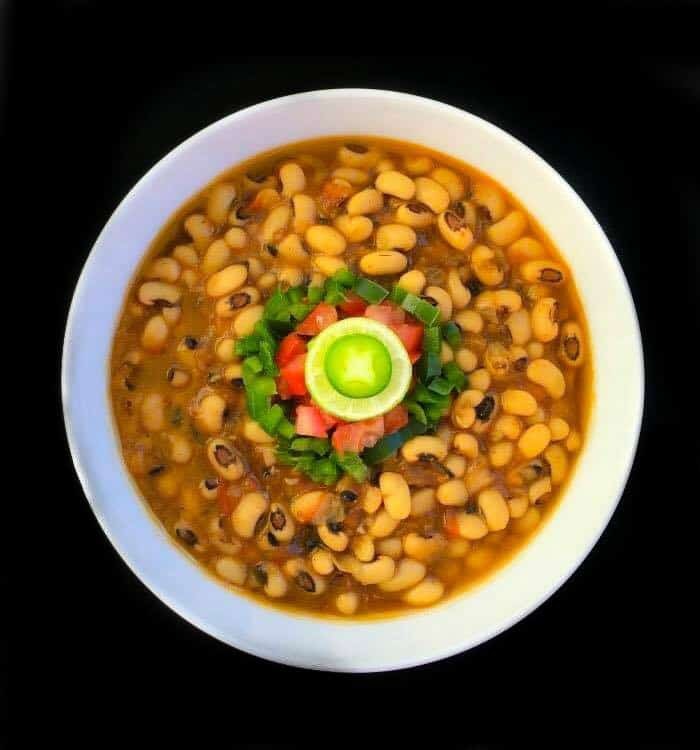 LOVE black eyed peas….what a great idea making chili out of them!! Black Eye Peas are the forgotten legume. Thanks for sharing. Always love trying a new Black Eye Pea recipe. This looks delicious. I’ve never tried cooking black eyes peas myself. This is a great place to start. We love blackeye peas in my culture. And I love how you made black eye peas with a twist! I am so use to cooking them with a smoked meat, so I look forward to making your recipe. Just like you, I only want something light right now because oh my gosh! my veins are full of turkey gravy and dressing right now! ugh! lol happy cooking! 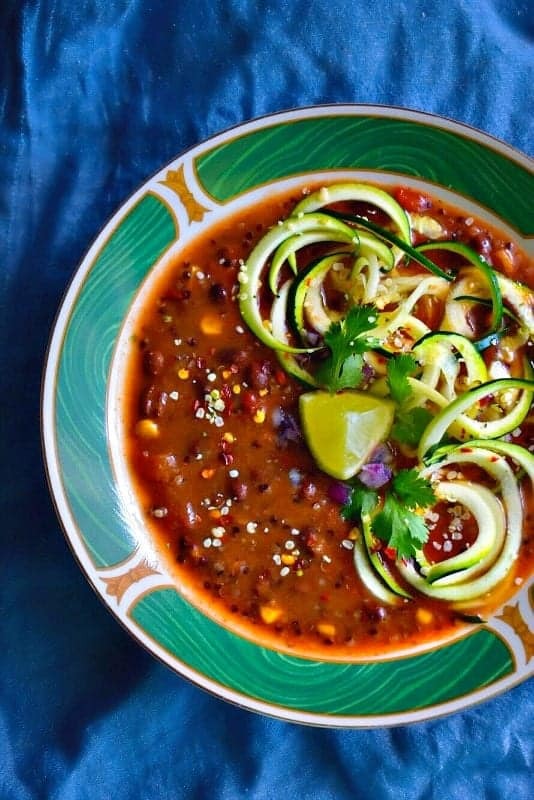 Your chili recipe sounds fabulous! I love black eyed peas but would have never thought to use them in chili. Awesome idea.